Are aimed fire and point-shooting really all that different? Few would argue that this would be good way to engage a threat, but a target-focused approach in which the gun is brought into the vision plane and the trigger controlled correctly just might be. The debate between sighted fire and point shooting, more accurately described as target-focused shooting, rages on. What mystifies me is why the shooting world feels like it must pick one or the other. I started interviewing gunfight veterans while in the police academy in 1976 after being disappointed with my firearms training. One of the questions I always asked people who had been in gunfights was, "Do you remember obtaining some type of sight picture or even seeing your sights?" As time went by, I realized that the circumstances often determined the answer to this question. Based on what I have been told, the determining factor as to whether or not an individual used their sights was if they saw the fight coming. Universally, those who were surprised drew and fired their handguns in almost a panic mode without trying to aim. But what is "aiming"? 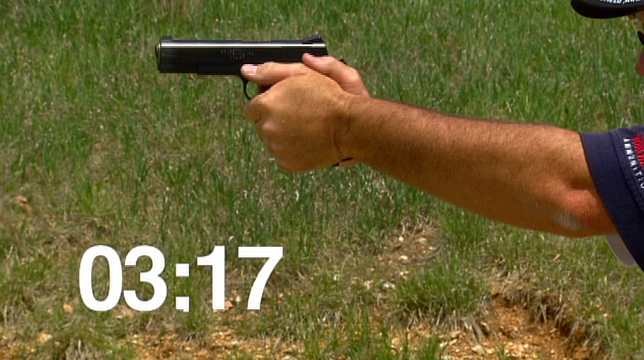 Is it possible to aim a handgun without sighting it? I believe so--within reason. Ogden, Utah, Deputy Police Chief Randy Watt, a decorated Special Forces veteran, wrote an excellent article titled "Point Shooting--Fact or Fallacy" (The Tactical Edge, Winter 2007) in which he discusses research done by his department into whether or not point-shooting is superior to sighted fire. One of the department's conclusions was that point-shooting does not work as well as distance increases. Most people would consider that obvious. Many advocates claim that point shooting works as far back as 25 yards, but in the Ogden tests, the department found that both worked to about five yards but when distances moved to seven, accuracy dropped off greatly for point-shooting. Much has been said about the human ability to use sights when in combat. Experts say that when the sympathetic nervous system is activated--essentially jump starting the body for combat--the eyes are locked to the threat as we gather information on what is happening. The body wants to keep track of what the threat is doing to make a decision on response; the brain wants real-time information, which it gets through vision. This makes a great deal of sense, and I have personally experienced it. So in such a circumstance, is it realistic to think that one can pull his vision away from a deadly threat and focus on tiny piece of metal? Simultaneously, we realize that the fundamentals of shooting create accuracy. By having a solid grip, good body position, sight alignment, sight picture and proper trigger control, our rounds will go where we want them. There are few things more satisfying than putting a nice, tight group on target, but if any of the fundamentals are ignored, our ability to shoot accurately falls apart. And don't point-shooting advocates call for dismissing at least some of the fundamentals? Well, not really. Let me offer a bit of harsh reality: Everybody point-shoots. Consider what is accomplished when a handgun is brought onto a target. 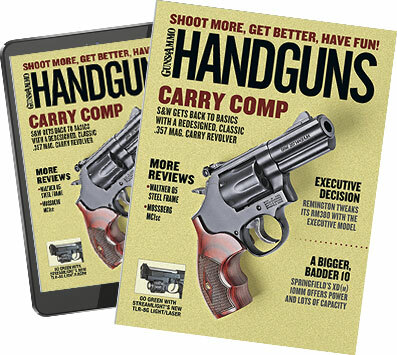 Whether it comes from ready or the holster, the upper body must make several motions that if accomplished consistently will bring the gun to the eye/target line every time. Since shooting is accomplished from the waist up, it does not matter if these motions are from a prone, kneeling, crouched or standing position--the same motions must take place in order to deliver the gun into a position where it can be used. Even the late Col. Jeff Cooper understood this physiological fact when he made the statement, "The body aims, the sights confirm." If the gun is moved in a consistent fashion--the same way every time--the gun will arrive where you need it. If this is not point-shooting, I'm not sure what is. The fact is, the "felt" aspects of shooting are grossly underrated, and we need to focus more on what it feels like to deploy the gun correctly than on making it a visual exercise. Think about it: The eyes are really the last thing used to fire an accurate shot. The torso, arms and hands are what really shoot the gun. Everyone reading this has felt a shot go wrong; we knew it as the bullet was going downrange, and during the next shot we concentrated on correcting it. But how many of you corrected this by focusing harder on the sight picture versus concentrating on making the trigger stroke feel right? About half and half, I would guess. I believe that more shots are missed due to inadequate trigger control than to poor sight alignment. Some claim trigger control is not important due to the closeness of most confrontations, but I must respectfully disagree. Every one of us has seen people shoot into the dirt in front of the target, which is the result of convulsively squeezing the entire hand versus trying to separate the trigger finger from the rest. Digital dexterity is lost during a fight, but that is no excuse for just ignoring reality. Officers will not "rise to the occasion" during a confrontation--they will default to their level of training, and trigger control must be a big part of this training. I just don't see the big difference between target-focus shooting and sight-focus shooting as both require kinetic harmony to work. Many of the people involved in gunfights I spoke to told me that while they did not remember looking at their front sights, they were very aware of their guns in their plane of vision, which tells me the guns got to the eye/target line. It also tells me that the shots they fired were directed, thus aimed. I strongly advocate the use of a bright, contrasting front sight on handguns. Those I spoke with who remembered using their sights were revolver shooters who had colored inserts in their front sights; they recall seeing a "flash of color" in their lines of sight during the fight. It seems to me that teaching a person to use the sights does not exempt them from being able to shoot with a target focus. If the gun gets on the target efficiently and the trigger is controlled successfully, does it really matter if the sights were referenced or not? As a matter of fact, try it during training. Shoot a drill the same as you would when using the sights, but look at the target instead. You will be surprised at how well you shoot--but, again, the closer the better. e end, how you train is your decision.